Diego Costa enjoyed a typically eventful return to action for Atletico Madrid on Wednesday, scoring within six minutes of coming off the bench in his side's 4-0 King's Cup win at Lleida Esportiu but appearing to injure his knee in the process. Costa turned Juanfran's low cross into the net in the 69th minute for Atletico's third goal in the first leg of the last 16 tie against third division Lleida but immediately limped to the sidelines. He did return to the pitch, however, and completed the game despite bleeding from his knee. Diego Godin had headed Atletico in front in the 33rd minute following a free kick and Fernando Torres slid in to double the lead, completing a sweeping counter-attack although he was fortunate not to be ruled offside. Antoine Griezmann completed the rout with a goal from a free kick in stoppage time, moments after the home side had defender Marc Trilles sent off for a second yellow card. The win put Atletico on the verge of the quarter-finals, with the second leg at their Wanda Metropolitano stadium on Jan. 9. Elsewhere, Sevilla beat second division Cadiz 2-0 away in former AC Milan coach Vincenzo Montella's first game in charge. Early goals from Nolito and Jesus Navas put the 2016 finalists in charge although the home side missed a late penalty. Spain international Rodrigo Moreno struck late to salvage a 1-1 draw for Valencia at Las Palmas and last year's runners-up Deportivo Alaves eased to a 3-1 win at tiny island side SD Formentera. Costa completed a 57 million-pound ($77 million) move back to Atletico from Chelsea in September, having left the club in 2014 after firing them to the La Liga title. The move was delayed by the club's ban on registering new players which expired on Jan. 1. 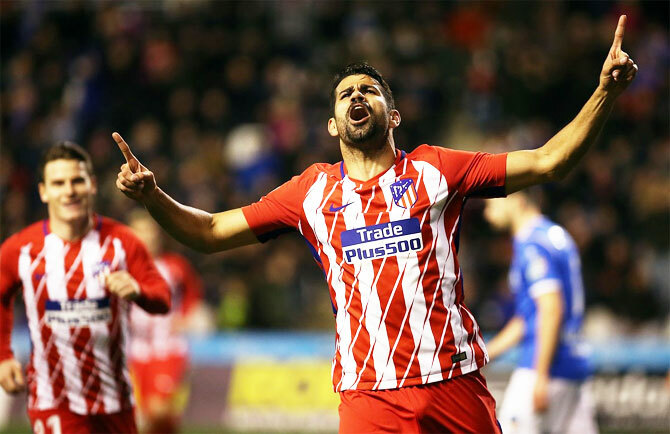 Costa immediately gave his side an extra edge, charging into challenges and provoking opponents as well as starting and finishing the move for the third goal, his first strike for Atletico since scoring against Chelsea in April 2014. "In those first five minutes he showed what he is all about and I hope he can keep it up," Atletico coach Diego Simeone told reporters. "But we have to take it easy, it's bad to get carried away. He is quick, determined and strong, but (Kevin) Gameiro and Torres played well too, the team played well as a collective." Spain international Vitolo, a 40 million-euro signing from Sevilla who spent the first half of the season on loan at Las Palmas, also made his debut for Atletico by coming on in the second half. "The arrival of these players will help us grow," Simeone added. "I hope they improve us and give us more power and drive. They are top level players and they bring us extra competition." Barcelona's record signing Ousmane Dembele has been named in the squad for Thursday's King's Cup last-16 first-leg game at Celta Vigo after over three months out with a hamstring injury. The France forward ruptured his hamstring 29 minutes into his first Liga start for Barca against Getafe in September following a club record 105 million euro ($126 million) signing from Borussia Dortmund. That made him the second most expensive player in the world after Paris St Germain forward Neymar. Dembele, 20, underwent surgery in Finland and was given the all-clear by Barca's doctors on Tuesday, although Barca coach Ernesto Valverde plans to introduce the player back into action slowly. "Recovering Ousmane is very positive for us, he got injured just as he was adapting to the team," Valverde said. "We will give him minutes little by little but he also has to earn his playing time." Spanish and English media reported that Barca, the La Liga leaders, are close to smashing the record amount they paid for Dembele by signing Brazil midfielder Philippe Coutinho from Liverpool for 150 million euros. "He plays for another team, he's a good player and we don't know what will happen in the future but I'm happy with the players I have right now," Valverde said. Coaching offers: Will Ponting choose Aus T20I team over Daredevils?